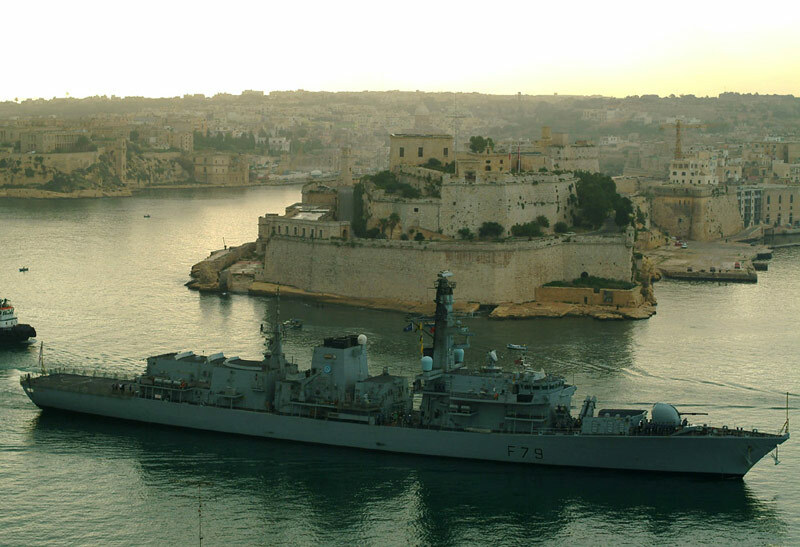 The STANAVFORMED ship HMS Portland arrives on 10 October 2003 in La Valetta harbour. 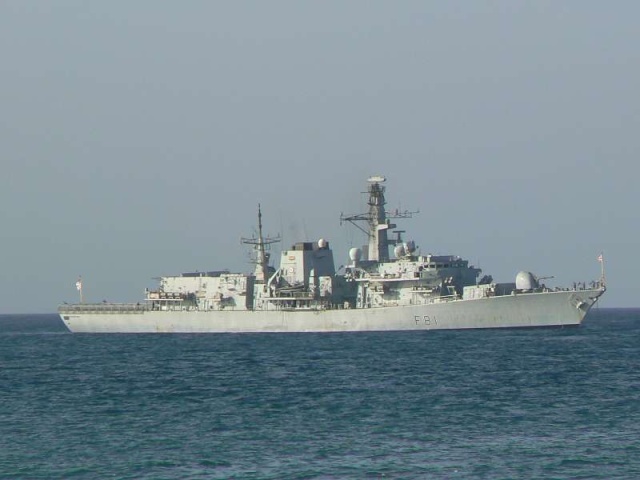 The Frigate is the current British contribution to the NATO Mediterranean Fleet STANAVFORMED, which visits Malta until 12 October 2003. Frégate Type-23 : Norfolk - Argyll - Lancaster - Marlborough - Iron Duke - Monmouth - Montrose - Westminster - Northumberland - Richmond - Somerset - Grafton - Sutherland - Kent - Portland - St Albans. Propulsion/énergie : CODLAG (Combined Diesel and Gas): 2 turbines Rolls Royce, 4 GEC Paxman-Valenta diesel engines, 2 GEC electric motors. 2 tubes lance torpilles anti-submarine, NATO Seagnat and DFL3 decoy launchers. 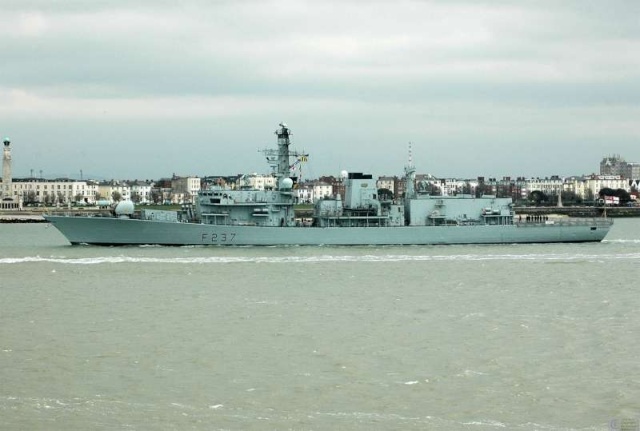 The Type-23 Class frigate HMS Westminster (F 237) arriving in Portsmouth Harbour on 23/03/2007. HMS Richmond entering Portsmouth harbour - 09/05/2007. 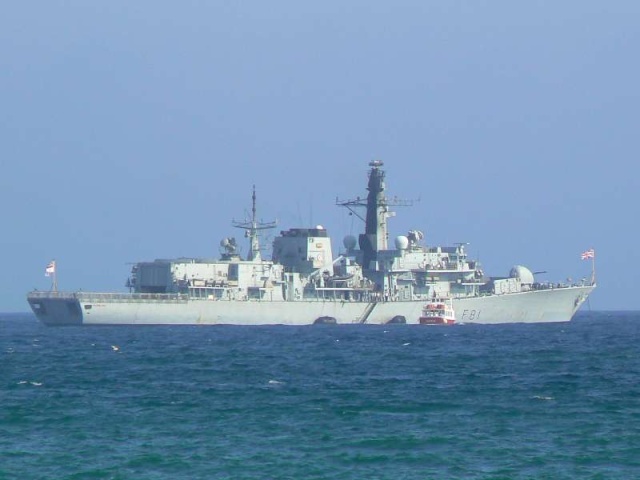 HMS Sutherland (F 81) anchored at Palma de Mallorca Road on 13/06/2007. 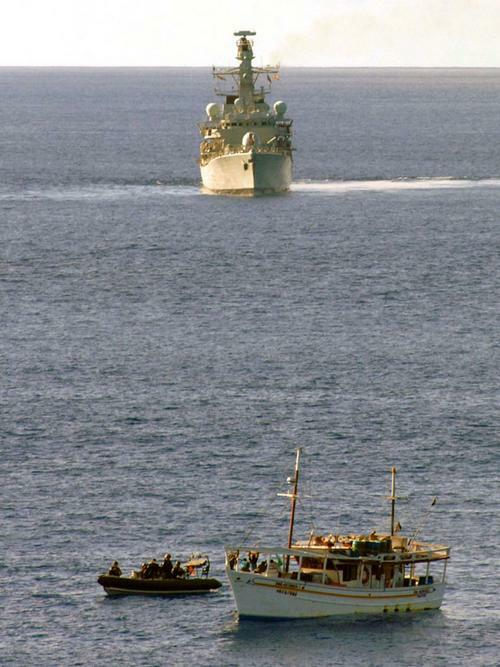 Une photo du sonar de coque d'une frégate du Type 23. Sonar 2087 is a tactical, variable-depth, active and passive anti-submarine warfare (ASW) system to be fitted to Type 23 Frigates. It will replace the passive towed array Sonar 2031 and be integrated with the bow-mounted, active Sonar 2050. 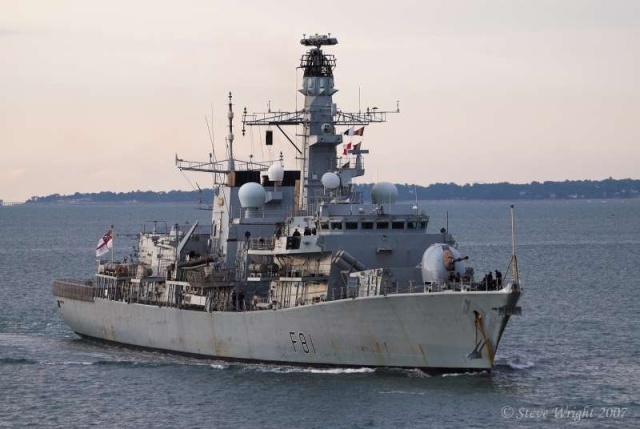 Sonar 2087 will significantly enhance the Royal Navy's ASW capability by improving the Type 23's ability to detect, classify and track submarines, which remain one of the main threats to our maritime forces in times of conflict. 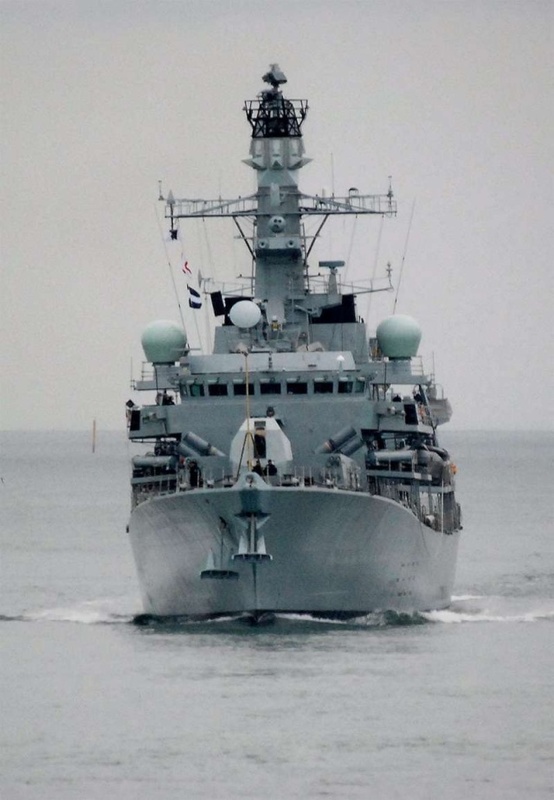 The need for a more capable Anti-Submarine Warfare (ASW) sensor for the Type 23 Frigate to replace the Sonar 2031 passive towed array is driven by the noise quietening advances in the construction both of SSNs (Nuclear Propelled Attack Submarines) and SSKs (Conventionally Propelled Attack Submarines). 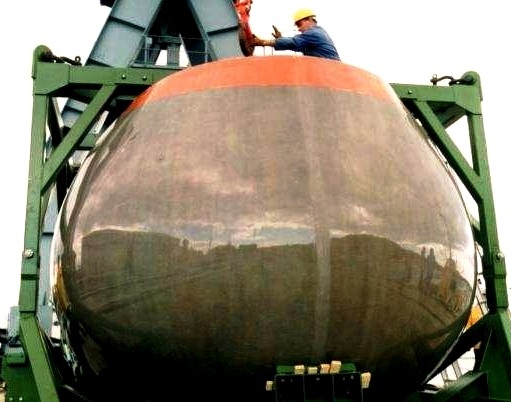 The Staff Target for a fully integrated, variable depth, towed active and passive sonar system, designated S2087, to counter current and future SSN and SSK threats was approved in April 1994. 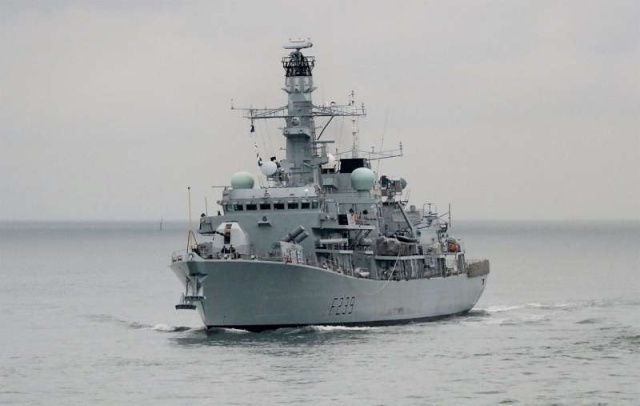 The sonar will significantly improve the Type 23 Frigate’s ability to detect, classify and localise submarines at a range beyond the threat of attack. The sonar suite will be fully integrated into the Type 23 Combat System whilst requiring minimum change to the T23 Command System (DNA(1)). Sonar 2087 will be fitted to T23 Frigates during refit and integrated with the existing bow-mounted active sonar. Sonar 2087 will transmit at frequencies lower than those used currently in RN Surface Ship active sonars. These lower frequencies take advantage of better propagation of sound, giving greater detection ranges. In order to exploit advantageous environmental conditions, the towed body, which contains the transmit array, can be deployed to the optimum depth for detection and tracking of the target. The transmit array is physically large and heavy and the whole handling system is to be designed to fit within the constraints of the current T23 Frigate quarter-deck dimensions. Sonar 2087 also incorporates a passive array, as passive sonar detection of submarines remains an important ASW tenet. This array must be stored and handled using the space currently occupied by the Sonar 2031 winch and will feature digital telemetry rather than the current analogue system. The active and passive modes are capable of independent streaming, recovery and operation and will facilitate easy transition between the two, such that uninterrupted operations can be achieved with the chosen mode while the other is streamed or recovered. Both the receive and transmit arrays are independently deployable to their optimum operating depths in order to provide the best possible sonar performance commensurate with the prevailing oceanographic conditions. Sonar 2087 will be able to operate in a wide range of environments from the deep blue ocean to littoral and from tropical through temperate to arctic waters. It is possible to deploy and recover the active and passive outboard systems in sea conditions up to sea state 6. 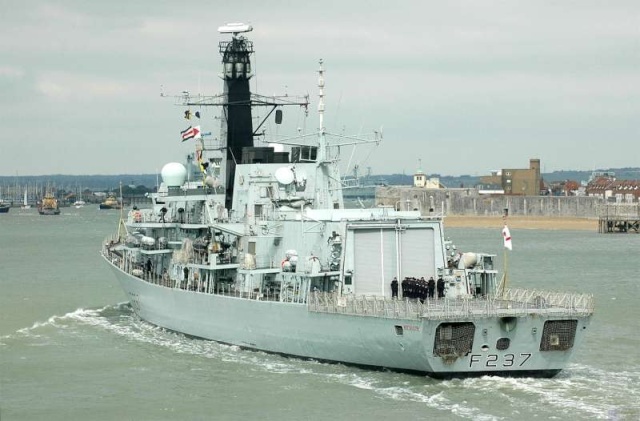 Both systems are also capable of operation up to the maximum operating sea state of the Type 23 Frigate. Sonar 2087 should not be affected by electrical storms or lightening strike. In addition, the operation of the active towed body and the passive array should be unimpaired up to normal cruising speed. All arrays are designed to survive up to the maximum designed speed of the towing unit/vessel. The Sonar 2087 suite will be designed to integrate with the existing T23 Sonar 2050 bow mounted sonar, the future Surface Ship Torpedo Defence system and the T23 Command System (DNA(1)) via a Combat System Highway. It should require no increase in manning over that currently required for Sonar 2031 and the extensive use of Commercial Of The Shelf (COTS) hardware, re-use of software and the imposition of ILS disciplines should ensure reduced Whole Life Costs. Project Resource Cost Summary at out-turn prices to the nearest £10M: £340M VAT Inc estimated acquisition cost. A total of 16 sets are planned to be produced, 12 of which are full sea-based sets. The remaining four are shore based part sets for: a Shore Integration Facility; a contractor reference set; and an assumed maximum of two sets for the training of both operators and maintainers. In-Service Date (ISD) is the date at which the equipment achieves Initial Acceptance and is planned for May 2006. This will be followed by the achievement of Initial Operating Capability, planned for Jan 2007. The assessment phase was completed in 2000. 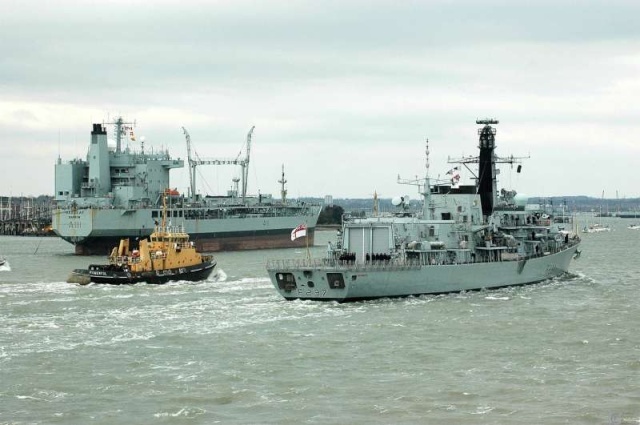 The two competing contractors were Babcock Defence Systems Ltd and Thomson Marconi Sonar Ltd (TMSL). Main Gate approval was given in January 2001. In March 2001 TMSL (since re-named Thales Underwater Systems Ltd) was announced as the winning contractor and the Demonstration, Manufacture and Support contract awarded to them in April 2001. The initial contract is for the supply of six ship sets. There are also fixed-price options in the contract that allow for the purchase of a further batch of six sets and the Full Operating Capability increment. 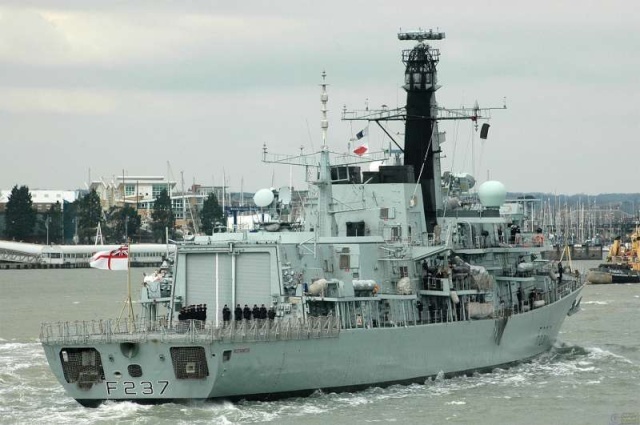 International collaboration was considered but because of the unique UK requirements and the constraints of the Type 23 Frigates it was decided that a national programme was more appropriate. n'est ce pas cette classe de frégate qu'il a été un moment question d'acheter à la place des fégates M? Si c'est bien de ce type de frégate dont il a été question à un moment ! Quatrième dossier : frégates - Enfin, le Gouvernement a décidé d'entamer les négociations avec les Pays-Bas par rapport à l'acquisition de deux frégates multifonctionnelles d'occasion. - Elles doivent venir remplacer les frégates actuelles Wielingen et Westdiep. - Fin 2003, la Belgique a eu l'occasion de reprendre 2 M-frégates d'occasion de la Marine hollandaise qui elle-même devrait en conserver 6. Les deux frégates hollandaises ont été cependant vendues en mars 2004 au Chili. L'intérêt belge pour des frégates d'occasion a cependant perduré et, dans l'intervalle, des négociations ont été lancées avec la Royal Navy, concernant l'éventuelle reprise de 2 frégates T23. Fin juin 2005, celles-ci semblent néanmoins de nouveau avoir été vendues au Chili. Depuis quelques semaines, les Pays-Bas semblent envisager de se défaire de frégates supplémentaires et s'intéressent dans ce but à la Belgique. - L'étape suivante est désormais la signature d'une Letter of Intent (LoI), à la suite de laquelle les modalités précises concernant l'acquisition pourront être négociées. - Cela devrait permettre, à moins que les deux Marines ne disposent de flottes identiques (P-B en conserve 4), de renforcer davantage la coopération déjà existante entre la Marine belge et hollandaise (opérations, formation, entraînement, logistique). - Une reprise de ce type devrait sécuriser la capacité d'escorte de la Marine jusqu'aux environs de 2025. - On convient que le premier navire pourrait être livré en 2007, le deuxième en 2008. - Ce projet devrait représenter un montant de près de 200 Mio d'euros. Mais d'après ce que j'ai vu, le Chili aurait racheté les frégates type 23 sans le système de sonar remorqué ! Bref, ils ont fait comme nous avec les M-frégates ! Le sonar actif basse fréquence "Folding Light Acoustic System for Helicopters" (FLASH) rencontre un succès croissant depuis 15 ans. 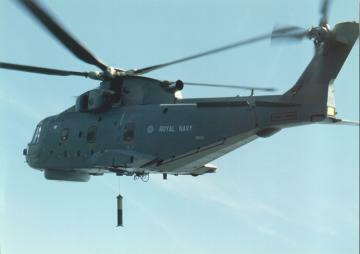 En 1992, l'US Navy l'a notamment sélectionné pour ses hélicoptères Sea Hawk, alors que la Royal Navy décidait d'en équiper ses Merlin EH 101. Il est désormais en exploitation opérationnelle au Royaume-Uni et en phase de production de série pour les Etats-Unis, qui doivent acquérir environ 200 systèmes. « Excellent en détection, classification et localisation, il dote les hélicoptères du moyen le plus performant de Lutte Anti Sous-Marine pour la poursuite et l'attaque des sous-marins, dans les environnements opérationnels les plus difficiles. Il peut intégrer un système de traitement de bouées, également fourni par Thales, pour les NH90 et EH101 », souligne Thales. 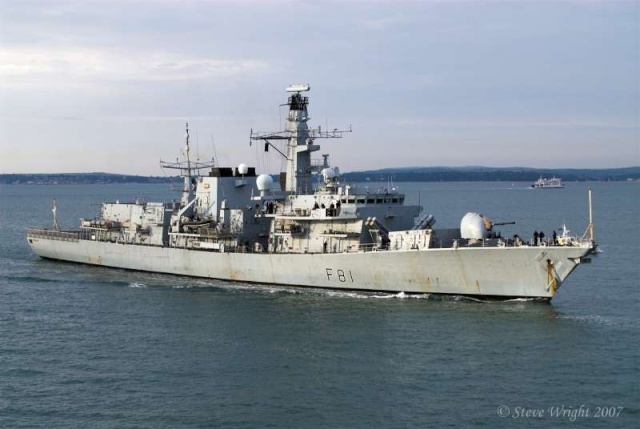 HMS Sutherland (F 81) entering Portsmouth Harbour on the 10th September 2007. 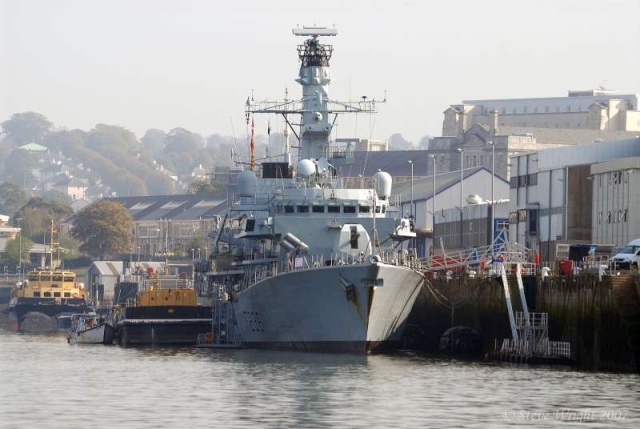 HMS Montrose alongside at Devonport Naval Base on the 11th October 2007. 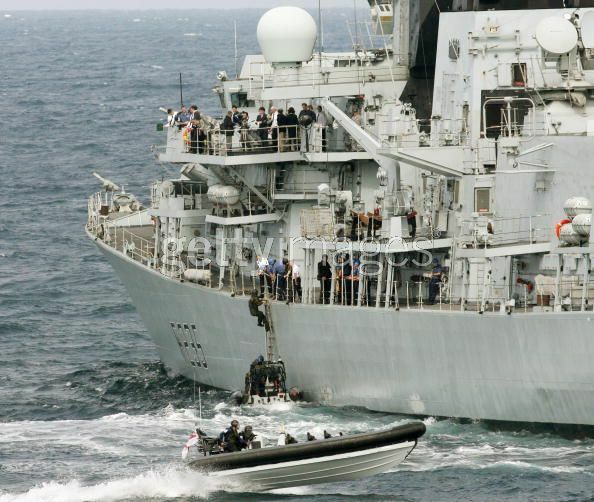 Plymouth based Royal Navy warship, HMS Portland, has just made a drugs bust in the North Atlantic. Conducting a routine patrol, she launched her Lynx helicopter for a dawn search and found a suspicious looking fishing vessel. 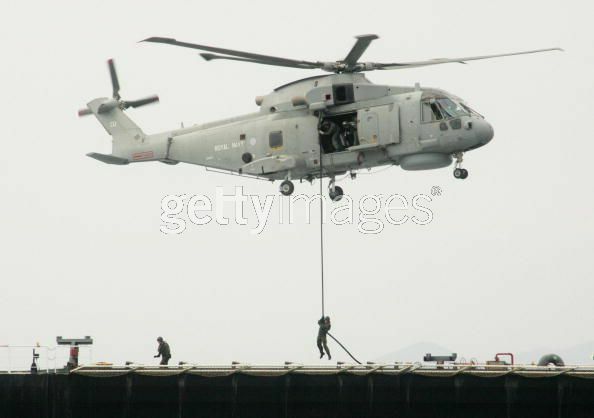 The decision was made to make a coordinated approach using the ship’s sea boats, helicopter and the ship itself. As the vessel was approached she increased in speed and the crew were seen throwing packages over the side. Once it was clear she could not escape, the vessel stopped and Portland’s boats recovered 500 kilograms of what turned out to be cocaine from the sea. Having recovered the contraband onboard, the embarked US Coastguard Law Enforcement Detachment (LEDET) contacted authorities back in the United States in order to gain permission to board the Venezuelan registered vessel. 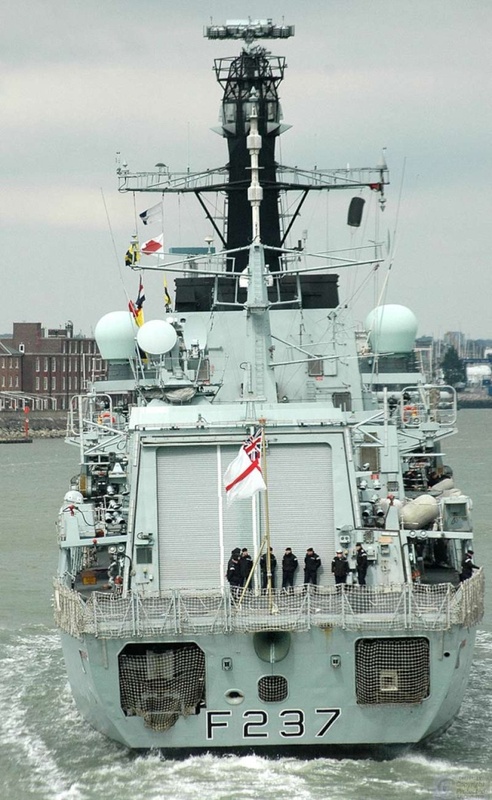 Having presented conclusive evidence, approval was given and Portland boarded the vessel using her LEDET team, augmented by sailors and Royal Marines of her own Ship’s Company. Following an extensive search over a ton and a half of cocaine was found onboard. The vessel is now being escorted to Venezuela where the local authorities will take over. The aim of Portland’s deployment to the North Atlantic and Caribbean is to provide support and reassurance to UK Overseas Territories whilst being ready in all respects to conduct humanitarian disaster relief, particularly in terms of post hurricane support. 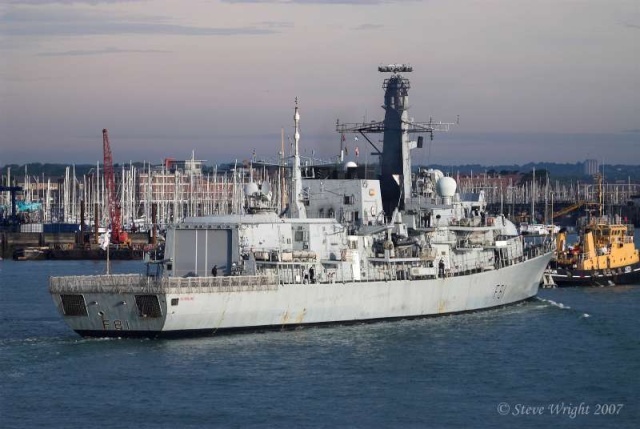 Earlier in her deployment Portland was involved in the relief effort in Belize following Hurricane Dean. 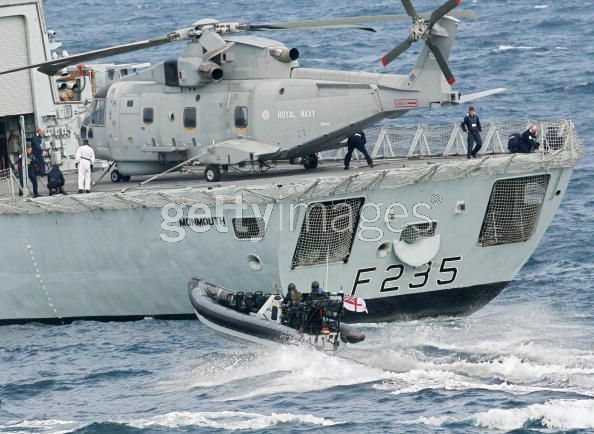 Outside of this programme the Ship is available for counter-drugs operations, reducing the illegal supply of narcotics into the United Kingdom and Europe and working closely with the United States Coast Guard. The Ship has done a number of boardings over the past five months and, although this is the first time narcotics have been seized, it has recently been confirmed that another vessel had 3.3 tonnes of cocaine onboard which was ditched shortly before she was intercepted. Portland returns to the UK to be reunited with friends and family in time for Christmas.